The ESRF/ILL/EMBL/IBS site is easily reached by car using the motorway connections. When coming from Geneva, Chambery or Turin on the A41 motorway, follow the signs for the "Rocade Sud/N87" (the Grenoble ringroad) direction "Lyon". This will take you on to the A480. Continue on the A480 in the direction of "Lyon". Leave the A480 at exit N°1 for the"Polygone Scientifique". At the roundabout turn right. The entrance to the site will then appear on your right after several hundred metres. When coming from Lyon or Valence, stay on the A48 when approaching Grenoble, following signs for "Grenoble Bastille-Gares-Europole". Leave the A48 at exit N°16 ("Polygone Scientifique") and cross the suspension bridge over the Isère. At the end of the bridge filter right and turn right, heading north along the Rue des Martyrs (D531). The new site entrance is on the left after a few hundred metres (traffic lights). Lyon International Airport, Saint Exupery Airport, is the most convenient airport to reach Grenoble. For more information, visit the Lyon Saint Exupery website (or phone +33 (0)4 72225000). Lyon Saint Exupery Airport is a one-hour drive from Grenoble and regular shuttle buses ('Navette Aéroport') operate to and from Grenoble bus station (‘Gare Routière’), which is next to Grenoble railway station. The LYS Express shuttle bus is now run by the OUIBUS company. You can book seats via OUIBUS. 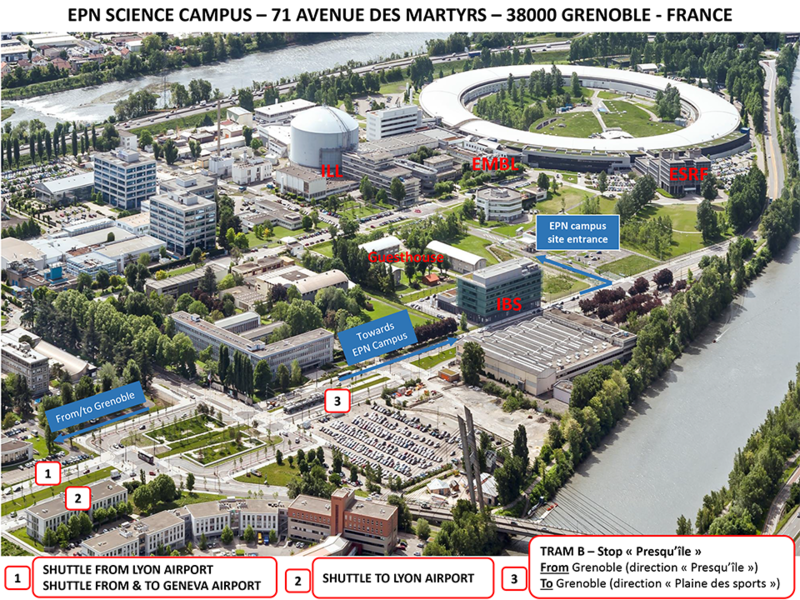 The bus will stop near the ESRF/ILL/EMBL site on request, so that you do not have to go as far as the bus station. Ask for the bus stop called 'Place de la Resistance' situated at the roundabout by the 'Pont d'Oxford' (suspension bridge) motorway exit (this is also the stop for local buses EXP 1 & EXP 2). You must tell the bus driver when boarding at the airport that you want to be dropped off at "Presqu'île - Résistance". Otherwise, despite it being an official stop, the driver may not stop! You are less than 10 minutes walk from the EPN Campus. On your way back to the airport, be sure to use the bus stop near the roundabout on the 'Pont d'Oxford' side of the road from where you got off. * Early morning buses from Grenoble (from 4 am) and late night buses from Lyon airport (last departure is 0.30 a.m) are available with prior reservation (72 hours in advance). * Extra buses are scheduled during peak periods (every 30 minutes) is demand is sufficient. A shuttle bus service runs between Geneva International Airport and Grenoble coach station: http://www.aerocar.fr/fr/. Buses run 5 times a day (timetable). Reservation is recommended (online or by phone: +33 (0)974 500 750, or at coach station). There is also a regional airport at St Geoirs (Grenoble Isère Airport, 30-40 minutes from Grenoble) that offers one flight a day to/from London's Stansted airport during the winter period (EasyJet). There is a bus from Grenoble St. Geoirs Airport to Grenoble bus station that is timed with flight arrivals. The return bus from Grenoble leaves approximately 2h30 before the departure of each flight. This information is subject to change, please check the Grenoble Isère Airport website for precise times. There are very good train connections from Paris by TGV, the direct, high-speed train (3h). Please note that seat reservations on the TGV are obligatory and should be made when you buy your ticket. There are also train connections with Geneva, Chambery, Turin, Valence, Marseilles, Barcelona, etc. Visit the SNCF website for more details (or phone +33 (0)8 36676869). The EPN research site is well connected to the public transport network. Tram B links the site to the coach and railway stations and to Grenoble city centre; its terminus - 'Grenoble Presqu'île' - is situated just 350 metres from the site entrance. Grenoble's trams operate 7 days a week, from 5 a.m. to 1 a.m. approximately. For detailed timetable, click here. The bus service C6 goes to Fontaine, Seyssinet and Seyssins, among other places. It has the same frequency and operating hours as the tram (7/7 from 5 a.m. to 1 a.m.). It stops at the bus stop 'Martyrs Résistance', which is situated right outside the site entrance. Click here for timetable. Bus n° 54 goes to Sassenage and St Egrève. It stops at the bus stop 'Martyrs Résistance', which is situated right outside the site entrance. Click here for timetable. Bus n° 22 goes to St Egrève. It stops at the stop 'Grenoble Presqu'île', which is situated 400 m from the site entrance, next to the terminus of tram B. Click here for timetable. The bus service 5100 goes to Villard de Lans (Vercors). It also stops at the bus stop 'Martyrs Résistance', right outside the site entrance. See the Transisere website. The Transisere bus services Express 1 (Voiron-Grenoble-Crolles) and Express 2 (Voreppe-Champ-près-Froges) stop at Place de la Résistance, 600 m from the site entrance.